A busy Thursday this week…..
Peaches are in abundance right now, we should continue to have them through the summer. Blackberries are in now, we will have them for a few more weeks. Watermelon and cantaloupes are ready… we will have them as well. Everyone keeps telling us how delicious they are, we concur. For the third year Russell Veggies will be taking their “Mobile Market” to New Albany’s senior communities. 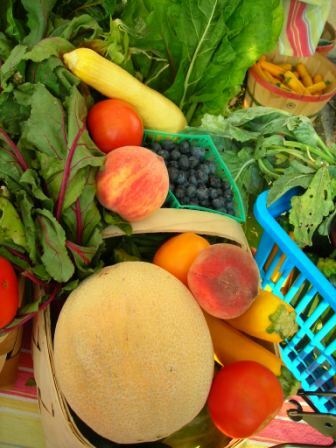 We will again offer fresh fruit and veggies to those who are unable to come to the farmer’s market. We feel it is our social responsibility to serve others and give back to our community. If you have friends or family that can take advantage of this service please let them know about this service. We will be at both Mark Elrod and the River View Towers. We will be at each site on Thursdays for approximately one (1) hour. **Remember we participate in the Indiana Senior Nutrition Program.